Happy Holidays to all! We've had a lot of fun this year, and hope you have, too. Please join us the next three weeks for the continuation of our Composers' Wisdom series -- brief comments by composers and one piece of their music. It gives all of us a chance to reflect on the diversity of new music outside the "popular" genres. It's the end of 2000 and time for contributions! The remarkable and unexpected gift we received in October from the Argosy Foundation gave Dennis and David, the creators of Kalvos & Damian, a little breathing room for the first time in nearly six years of hosting this costly project. Now, as the year closes and tax considerations are upon you, we're asking for your help in letting Kalvos & Damian complete the work of transcribing interviews, presenting more composers to listeners, and deepening this long-time web resource. The K&D site received 55,000 visitors and nearly 5 million "hits" in the past year ... but there were only eleven fourteen (thank you!!) monetary contributions to K&D in that same 12 months. So it's time. There are many ways to contribute -- head for our contact page to mail us a contribution, go to our funding page to read more about what we do and how your contribution will be used and how it is tax-deductible (to the extent provided by law, etc., etc. ), or simply click this link to make a PayPal contribution or click any one of the PayPal icons found on every K&D page (if you sign up through our link, we'll also get a $5 bonus). So please help us move ahead, and perhaps even give us a little holiday thanks for the cool composers you've met on Kalvos & Damian's New Music Bazaar. Shows #286-290 are now available. Hear interviews with David W. Solomons, Alexander Abele, and Brenda Hutchinson. David gives us a perspective that you don't often hear on K&D -- the Renaissance Musician from multiple points of view. Alex reveals how he handles many styles, forms, and sizes with great craftsmanship. And Brenda takes her piano in the U-Haul and sings an "Eee-yah!" version of the Tennessee Waltz. Don't miss 'em! These new shows join recent postings of shows #281-285. Listen to our interview with a panel of Mary Lee Roberts, Doug Repetto, and Larry Polansky, as well as the complete two-part birthday celebration with Elodie Lauten, a tour of the American Music Center with Frank Oteri, a live in-studio visit with John Levin -- and before those, recent previous interviews on shows #276-280 with David Del Tredici, Johnny Reinhard, Beth Anderson, and Doug Geers. The Listener Response Awards Page is finally up. We've delayed this long enough, so find out who won the awards for 1995, 1997, 1999, and 2000 (nope, nobody got 'em in 1996 and 1998). Sometimes ya gotta get silly. We have arranged to use the famous AlexWarp Java applet by Alex Rosen. It was popularized during the U.S. presidential election and even mentioned in Time. So ask for your favorite K&D guest composers, and we'll put 'em up for distortion. Kalvos is up first on K&D's Distort-a-Composer Page. Our ASCAP-Deems Taylor Award news release is up. Read it & celebrate with us! New York, New York is where Kalvos and Damian went to receive the 2000 ASCAP-Deems Taylor Internet Award at Lincoln Center. Full story and pix coming up next week! And you can also download this zip file of K&D's December 6 presentation at the awards ceremony. It's a 15MB chuck for only three minutes of show, and you'll need a fast PC to run it. But if you grab it, have fun! Best of the Bazaar Mark LVII is ready. Head over to the BoB pages and listen to Damian's latest sound collage! Shows #286-290 are currently being encoded. They should be available in a few days. You can find out who the guests were on our show history page. Join us December 2 for the beginning of astounding interview with Brenda Hutchinson along with the performance of her piece How Do You Get to Carnegie Hall? for broadcast in December, and as soon as schedules are confirmed, Paul Steenhuisen will be joining us live. We've also just received word that Jean Piché will be in the studio with us in the spring of 2001. Look for announcements!. Kalvos & Damian will be in New York December 6 to accept the ASCAP-Deems Taylor Award. See you there! Shows No. 281-285 are now available! Listen to the conclusion of our interview with a panel of Mary Lee Roberts, Doug Repetto, and Larry Polansky, as well as the complete two-part birthday celebration with Elodie Lauten, a tour of the American Music Center with Frank Oteri, and a live in-studio visit with John Levin. All of these join recent interviews posted with David Del Tredici, Johnny Reinhard, Beth Anderson, and Doug Geers. Join us November 25 for Part 2 of our interview with David W. Solomons. Breaking news: We have recorded our interview with Brenda Hutchinson along with the performance of her piece How Do You Get to Carnegie Hall? for broadcast in December, and as soon as schedules are confirmed, Paul Steenhuisen will be joining us live. We've also just received word that Jean Piché will be in the studio with us in the spring of 2001. Look for announcements! Our RealAudio Server was down, but all is well thanks to the team at Goddard College. Apologies to listeners who could not hear our show with John Levin yesterday. We are also experiencing heavy traffic, so please have patience when clicking on links! Our RealAudio Server is down. Archived files will be served, but the live stream is down. Apologies to listeners who could not hear our show with John Levin yesterday. We are also experiencing heavy traffic, so please have patience when clicking on links -- your audio will be delivered! Thanks to our network gurus at Goddard College for digging in on this! David W. Solomons joins us November 11 on Kalvos & Damian. Best of the Bazaar Mark LVI has been posted! Have a listen! Publicity-size photos of more than 30 composers are now available. If you're writing about one of these composers, please download these 300dpi 5x7's! There are photo links on each page. The alphabetical composer index is here. Accessibility? What's that? It's something that K&D has worked on for five years, and we're dismayed to see many artists aren't interested in making their sites accessible. Our accessibility statement doesn't get much traffic, so we thought we'd mention it a bit more prominently. See what's in our accessibility statement, including links to guidelines. Kalvos & Damian toured the American Music Center several months ago. Here are some photos to go along with today's broadcast/cybercast. Good Fortune! We Have a Winner! We Got Game! 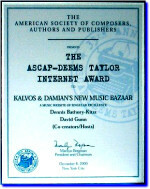 Kalvos & Damian receiveds the ASCAP-Deems Taylor Award. More details coming soon, but K&D just learned that it is the winner of ASCAP's second Deems Taylor Internet Award. are we a legitimate institution!? Say it isn't so! Kalvos & Damian receives a major grant from Alex Abele and the Argosy Foundation. It's been a stunning week -- good fortune continues. This major operating grant will make possible a number of projects that have been on hold, including our Montréal and Bay Area interviews, program transcriptions, and site updates. More details coming soon! Upcoming shows: American Music Center, October 28 ... John Levin, November 4 ... David W. Solomons, November 11 ... Alex Abele, November 18. Both a new essay and a new photo gallery by James Bohn! Great stuff, amazing point of view (both verbal and visual). Read The Compositional Importance of 'Huh?' and view The Moloch Photo Series. A true cyberspace reunion story by Kalvos is posted. The Golden Bruce III has been awarded to the Vermont Arts Council. The VAC joins National Public Radio and Vienna Modern Masters in the K&D roster of infamy. Read why! Shows 276-280 are ready to hear! Our two-part interview with Johnny Reinhard is up, joining the interview with Doug Geers, the interview with David Del Tredici, the first half of the combo interview with Mary Lee Roberts, Doug Repetto, and Larry Polansky, and Kalvos's intellectual property rant. Also, a few requested older shows from 1996 are now up: #74 with piano and string quartets, and #70 with recent releases from the autumn of that year. Read this appeal from Karlheinz Stockhausen to request release of his tapes from the WDR Studio for Electronic Music. The dilemma affects most composers who worked there. When you see the PayPal icon, please click it to contribute to K&D. Many thanks! Elodie Lauten Fiftieth Birthday Celebration! Elodie Lauten continues on K&D October 21, where our host station WGDR joins stations across the country celebrating Elodie's birthday with talk and recordings. Elodie Lauten on K&D October 14, where our host station WGDR joins stations across the country celebrating Elodie's birthday with talk and recordings. Join us at 2:30pm ET on Saturday, October 14, for the first of two parts! New Shows, Golden Bruce III, and more! Damian has finished Best of the Bazaar Mark LV -- and we forgot to broadcast it, so you can hear it before next week's official show. His what? Listen here: Best of the Bazaar, a whole bunch of 'em. Doug Repetto, Mary Lee Roberts, and Larry Polansky are our guests on October 7. Join us in part two of this interview and roundtable taped at the Red Kettle Restaurant, next week, October 7! A Four-Star Schoolzone Award has been presented to K&D. We're proud of this seventh show/site award in three years. A new essay by William Harris is posted. Read Metrics in Music and Poetry: The Cramping of Free Expression and Talent. Mary Lee Roberts is our guest on September 30. Join us in this interview taped at the Red Kettle Restaurant! Read musique concrète! Shows 276-278 are ready to hear! Our two-part interview with Johnny Reinhard is up, joining the interview with Doug Geers, the first part of our interview with David Del Tredici, and Kalvos's intellectual property rant. Also, a few requested older shows from 1996 are now up: #74 with piano and string quartets, and #70 with recent releases from the autumn of that year. Shows 274-275 (featuring Beth Anderson) are currently in Damian's hands as he works on his Best of the Bazaar Mark LV. His what? Listen here: Best of the Bazaar, a whole bunch of 'em. We'll have 274-275 available in late September. David Del Tredici is our guest on September 23. There are some surprises in this interview, so be sure to join in the live cybercast of the second half of this interview. David Del Tredici is our guest on September 16 and 23. There are some surprises in this interview, so be sure to join in the live cybercast! September 16 is also our Fifth Anniversary On-Line Celebration ... bouquets, brickbats, and contributions are invited! Contributions to K&D can now be made on line. To help us continue into our sixth year on line (starting September 16th! ), we'd appreciate your contribution -- click the PayPal icon on any K&D page to send us any size gift, even "micropayments" ... from the price of a Snickers bar through the cost of a CD to whatever your next car payment might be! For new PayPal users, there's a $5 bonus provided by PayPal for signing up. It's fast and secure (Kalvos uses it regularly). Imagine -- if we'd had PayPal from the start and every visitor had contributed 18 cents, this entire show and site would be paid for! Please help us out ... we have several major projects (including interview transcripts) that just can't get done without help. Please click the PayPal link! The Official Kalvos & Damian Most Listener Fan Calls Award goes to Beth Anderson's Minnesota Swale. Cool, huh? The previous piece to generate enthusiastic listener response was George Todd's Wordscapes and before that Christopher K. Koenigsberg's Rat's Nest. Remember that K&D is broadcast live and we're a For-Real Radio Show With Knobs and Buttons, so you can call us on Saturday afternoon to let us know what you think of the composers you hear. The more we hear from you, the more likely it is that WGDR will keep us on the air! A few pages additions and corrections have been made. We've added a new essay by Tom Johnson entitled Explaining my Music: Keywords. Another new essay is contributed by Rocco Di Pietro, the marvelous Dialogues with Pierre Boulez. The classic essay by John McGuire has been updated to fix many typos generated by the original optical scan ... it's An Electronic Music Project: The Composition of Pulse Music III. Also, there are now email addresses for Dennis Darrah and Udo Kasemets, and updated addresses and page links for Wendy Mae Chambers (hope you all caught her on Jay Leno a few weeks ago!) and Stephen Smith. Best of the Bazaar is an amazing feature. Every five shows, composer David Gunn does a five- to seven-minute mad mixcollage of sound bits. The latest Best of the Bazaars are ready to hear. And we even have a special full version -- click the link and listen to five-plus hours of mixes! And for the totally insane, keep in mind that we'll be broadcasting them in November in their entirety on a special overnight show; those of you within broadcast range can hear them in their full hi-fi stereo! There are a few photos of K&D's working world posted. Hah. Our latest newsletter will be published shortly; Here's the current Kalv News, with info on how to submit material to us. Elodie Lauten explained the earth tone and other cycles that underpin her composition and performance -- and secrets from her musical past. October 14-21 50th Birthday Celebration!. Lucius Weathersby will appear live on K&D this fall; his visit has been postponed from February. A few pages additions and corrections have been made. We've added a new essay by Tom Johnson entitled Explaining my Music: Keywords. Another new essay is contributed by Rocco Di Pietro, the marvelous Dialogues with Pierre Boulez. The classic essay by John McGuire has been updated to fix many typos generated by the original optical scan ... it's An Electronic Music Project: The Composition of Pulse Music III. Also, there are now email addresses for Dennis Darrah and Udo Kasemets, and updated addresses and page links for Wendy Mae Chambers (hope you all caught her on Jay Leno a few weeks ago!) and Stephen Smith. Although Beth Anderson's page isn't updated yet, look for it this week ... and join us for part 2 of her interview next week on our live cybercast. Shows 271-273 are ready to hear! Our two-part interview with Doug Geers is up, along with Kalvos's intellectual property rant. Also, a few requested older shows from 1996 are now up: #74 with piano and string quartets, and #70 with recent releases from the autumn of that year. K&D guest composer pages are being updated shortly. We have new information, updates, and audio clips for you about Joseph Benzola, Wendy Mae Chambers, Greg Hall, Tom Johnson (including a new essay), Jin Hi Kim, John McGuire, John Trubee, and Gwyneth Walker, plus Rocco di Pietro's interview with Pierre Boulez. Look for the announcement! Beth Anderson will be featured the next two weeks (August 19-26). Join us for some powerful points of view! PayPal coming soon. In order to make it easier for you to contribute to Kalvos & Damian's bank account (which pays for tapes, supplies, and other needs to keep this show and site running), we'll be putting a PayPal link in place shortly. Two good things happen for K&D when you sign up. We get a sign-up bonus, and you can contribute from pennies to millions! Best of the Bazaar is an amazing feature. Every five shows, composer David Gunn does a five- to seven-minute mad mixcollage of sound bits. The last Best of the Bazaars are ready to hear. And we even have a special full version -- click the link and listen to five-plus hours of mixes! We'll be broadcasting them in November in their entirety on a special overnight show; those of you within broadcast range can hear them in their full hi-fi stereo! Next week's show (August 12) will feature part 2 of Doug Geers as guest. We are missing some music needed for David Del Tredici's show, and have postponed it until September 30. Today's and next week's show (August 5-12) will feature Doug Geers as guest. We are missing some music needed for David Del Tredici's show, and have postponed it. Shows #266-270 are ready to hear! Interviews include Joseph Benzola, Gregory Hall, and Mary Jane Leach, and a Harry Partch 99th birthday special. These join shows #259-265, which include the conclusion of our interview with return guest Nick Didkovsky, as well as conversations with Warren Burt, and John McGuire. Two programs include the entire New Musics Festival 2000 from Dartmouth College, directed by Kui Dong. These new programs join the shows posted in April, #254-258, with guests Eric Salzman and Martha Mooke (our live servers were down during part 2, so be sure to listen to the archive! ), and the first part of our return visit with Nick Didkovsky. All this summer and autumn we continue to broadcast the interviews taped in New York City. Our thanks to John McGuire and Beth Griffiths for their hospitality and to the American Music Center and Mary Jane Leach for hosting our interviews. K&D did not receive an expected grant to transcribe its interview series into text for historical purposes and handicapped access. We are dedicated to making the K&D site accessible to all, so please help us with this important task. We are very, as they say, economically exposed and even a tad despairing. If you can transcribe interviews from our webcasts, please let us know. We are composing -- yes, both of us are still swamped. So K&D has taken a back seat while we finish our work. We finally have playlists up, and new shows now as well (see June 20 notice below). Also, please look at the latest playlist to see guest schedule changes. Next week's show (July 8) includes a live appearance by Gregory Hall, coming to visit from Down East. Following that will be the second half of our interview with Joseph Benzola. All this spring and summer we are broadcasting the interviews we taped in New York City. Our thanks to John McGuire and Beth Griffiths for their hospitality and to the American Music Center and Mary Jane Leach for hosting our interviews. The latest shows are posted! Shows #259-265 have been posted, which include the conclusion of our interview with return guest Nick Didkovsky, as well as conversations with Warren Burt, and John McGuire. Two programs include the entire New Musics Festival 2000 from Dartmouth College, directed by Kui Dong. These new programs join the shows posted in April, #254-258, with guests Eric Salzman and Martha Mooke (our live servers were down during part 2, so be sure to listen to the archive! ), and the first part of our return visit with Nick Didkovsky. We are composing -- yes, both of us are swamped. So K&D has taken a back seat for a month while we finish our work. We finally have playlists up, but not much else. New shows should be posted soon. Also, please look at the latest playlist to see guest schedule changes. Next week's show includes a special on Harry Partch on the occasion of his 99th birthday. Following that will be the first half of our interview with Joseph Benzola, and then a live show with Greg Hall on July 8. Are we useless, or what? We are composing -- yes, both of us. So K&D has taken a back seat for a month while we finish our work. We finally have playlists up, but not much else. New shows should be posted soon. Also, please look at the latest playlist to see guest schedule changes. Last month's shows are posted! Shows #254-258 have been posted, which include interviews with Eric Salzman and Martha Mooke (our live servers were down during part 2, so be sure to listen to the archive! ), and our return visit with Nick Didkovsky. We apologize if you couldn't reach us between about April 20-25. Our generous web hosts at Goddard College moved our site to a spankin' new disk drive, and we forgot to remind them of some very important web pointers. Duh for us! But all is well now, and thanks for your patience. The K&D website did not get overhauled the first weeks of April. Our webmaster and show co-host is finishing some music of his own. But we will get to it, and that may mean periods where the audio files are down, but we hope it'll be worth it. We're not changing the design this time around, but we are going to try to update all our resources, add all the missing sound files, bio, pix, etc., on composer pages, and delete most of the old TrueSpeech audio files. If you have any suggestions for things we should work on or fix, or have time to help update our resource pages, please contact us. Shows #245-253 have been posted! We're converting #254-258 this week. Next week's show includes the second half of an intense interview recorded in New York with Nick Didkovsky. Be sure to listen to how he creates music for his band Dr. Nerve, along with a preview of his CD for string quartet & Dr. Nerve. The K&D website will be overhauled in the next two weeks. That may mean periods where the audio files are down, but we hope it'll be worth it. We're not changing the design this time around, but we are going to try to update all our resources, add all the missing sound files, bio, pix, etc., on composer pages, and delete most of the old TrueSpeech audio files. If you have any suggestions for things we should work on or fix, or have time to help update our resource pages, please contact us. Shows #245-253 have been posted! Next week's show includes the second half of a wild interview recorded in New York with Eric Salzman. Be sure to listen to this showmeister and his predictions about the future of music! We've been late, and there will be lots of news soon, including the posting of a half-dozen new shows and updating of our resources. We'll let you know here! Next week's show includes a wild interview recorded in New York with Eric Salzman. Be sure to listen to this showmeister and his predictions about the future of music! The Kalvos & Damian Newsletter is posted. Please have a look -- and composers, there's a special section for composers with updated submission guidelines. Kalvos & Damian celebrated show #250 on March 4 with lots of tunes, and graced by live performances by Dennis Darrah and James Bohn. Scott MX and the Devil's Advocates played live on March 11 in K&D's famous Studio Z. If you missed this show, then look for the audio archive in the next few weeks. We'll let you know when it's posted. Next week's show includes a terrific interview recorded in New York with Carson Kievman. Be sure to listen ... Carson's diversity is marvelous! Kalvos & Damian are celebrating show #250 on March 4, then taking a much-needed week of incommunicado before our March 11 show with Scott MX and the Devil's Advocates. We'll answer your email again starting March 14. Show #250 is next week, March 4! Celebrate with us! Email us (Contact Form), call us during at WGDR during showtime 2:30-4:30 pm EST (+1-802-454-7762), drop us a line (176 Cox Brook, Northfield VT 05663 USA), or contact us somehow!. We need a party these days, especially since we're drowning in work and legal orders! Scott MX and the Devil's Advocates perform live on our March 11 show. Political rock comes to K&D for the second time in five years! Join us on March 11 during our cybercast -- or if you're in the vicinity, drop into the performance at WGDR's Studio Z! Let us know if you're coming so we can plan. We are now broadcasting the interviews we taped in New York City. Our thanks to John McGuire and Beth Griffiths for their hospitality and to the American Music Center and Mary Jane Leach for hosting our interviews. Eric Salzman proclaimed that the future history of new music will be written about and through music theatre in its many guises. April 1-8. K&D recently received a disheartening surprise in not receiving an expected grant to transcribe its interview series into text for historical purposes and handicapped access. We are dedicated to making the K&D site accessible to all, so please help us with this important task. We are very, as they say, economically exposed and even a tad despairing. We welcome Daron Aric Hagen to K&D's Board of Advisors. Kalvos & Damian is on MP3.com with a 5-hour rotating playlist, and it was chosen a site of the week on MP3.com -- we're delighted to have the notice! So if you want nice modern background music for the shop, this is the place! Pamela Zero, extraordinary vocal experimenter and upcoming K&D guest. We began broadcasting the interviews we taped in New York City. Our thanks to John McGuire and Beth Griffiths for their hospitality and to the American Music Center and Mary Jane Leach for hosting our interviews. Daron Aric Hagen regaled us with stories of the very intense ups and downs of an opera composer, causing us to ache with laughter. Part 2 on February 26. Doug Geers exposed the life of an eclectic doctoral candidate avoiding the intellectual gunsights of an east coast musical establishment. March 4-11. On arriving home last week, K&D received a disheartening surprise in not receiving an expected grant to transcribe its interview series into text for historical purposes and handicapped access. Please help us with this important task. Some More Shows You Missed! Hey! Every listen to Best of the Bazaar? These are composition/collages by co-host Damian (David Gunn). There are 48 of them. Wow! We've posted Shows #241 through #244, including interviews with Jeff Harrington and Peggy Madden. These join recently posted shows with Larry Polansky, Masahiro Miwa, Belinda Reynolds, and Peter Garland. We've also added interview clips on the pages of Howard Fredrics, Michael Frengel, Sarah Peebles, Matthew Fields, Larry Polansky to complement recent interview highlights with Jon Appleton, Peter Beyls, Rhys Chatham, Christopher Koenigsberg, John Levin, and Benedict Mason. These join Louis Andriessen, taken from his AmsterDramm appearance, David Behrman, James Bohn, Craig Bove, Allison Cameron, Kyle Gann, Elma Miller, Pauline Oliveros, Linda Catlin Smith, Ann Southam (whose complete interview is transcribed as well), and the late Peter Van Riper. ...to contribute to Kalvos & Damian's New Music Bazaar in 2000! Begin by supporting the continued presentation of new music and composer interviews -- and help us with our huge upcoming interview transcription project. K&D is a project of the Vermont Contemporary Music Ensemble, a 501(c)3 corporation. Support may be sent to K&D/VCME at 176 Cox Brook Road, Northfield VT 05663 USA. Contributions represent 15% of the K&D budget (the rest of which is provided by the co-hosts). We'd like to change this ratio! Please help us out so we can spend more time making this show & site valuable. Here is our 1998-99 Report to Contributors and here is our 1999 Supplement. A new full report for 1999-2000 will appear in March. More information is found on our funding page, or you can send us email asking questions about funding. We began broadcasting the interview we taped in New York City. Our thanks to John McGuire and Beth Griffiths for their hospitality and to the American Music Center and Mary Jane Leach for hosting our interviews. Beth Anderson revealed how playing for dance classes opened the door to new composition in the face of conservative horror. Barbara Benary took us on a tour of the moden gamelan, and how it has change compositional life and thinking. February 5 & 19. Joseph Benzola gave us the rundown on his composer/performer life and how percussive improvisation helps drive his music. Warren Burt talked about simple and economical means of creating sophisticated compositions; co-hosted with Mary Jane Leach. Daron Aric Hagen regaled us with stories of the very intense ups and downs of an opera composer, causing us to ache with laughter. February 26-March 4. David Del Tredici wove stories of forbidden tales from Alice to Dracula, and even played one of his early atonal pieces on his home piano. Nick Didkovsky teased us with a taste of his new CD for rock band and string quartet, and played live computer using his programming. Doug Geers exposed the life of an eclectic doctoral candidate avoiding the intellectual gunsights of an east coast musical establishment. March 11-18. Jeff Harrington talked in detail about how he composes with intense listening-loop feedback, what software he uses, and his future plans. January 15-22. Carson Kievman followed his struggle and discovery from experimentalist to powerful symphonist; co-hosted with Mary Jane Leach. Elodie Lauten explained the earth tone and other cycles that underpin her composition and performance -- and secrets from her musical past. March 24-April 1. Mary Jane Leach offered a peek behind the scenes of how her music went from composer's pen to publisher's press, and her new directions. John McGuire stripped away the myths surrounding concept, process, and creativity by detailing the creation of his large-scale music. Martha Mooke took the wraps off her role as the official yamahamster, and performed live improvisations on five-string electric viola. Frank Oteri took us on an audio 'walking tour' of the American Music Center and its physical and virtual spaces, and meeting its people. Johnny Reinhard proselytized on the human sensitivity to microtones, and offered insights, history, theory, and practical takes on it. Doug Repetto revealed how live performance on computers can be a remarkable structured improvisation. Mary Lee Roberts examined the role of the computer and of simplicity in creating music that reaches beyond its materials. Eric Salzman proclaimed that the future history of new music will be written about and through music theatre in its many guises. April 8-15. Gwyneth Walker returns live to K&D to catch us up on the recent work of one of America's most played composers. Live January 29. Lucius Weathersby will appear live on K&D as part of Black History Month, playing organ music by American masters. Live February 12. Our New York City interviews were intense! It was three days of madness, speaking with one of the most diverse groups of composers Kalvos and Damian have encountered -- broadcast/cybercast schedule news soon! Our thanks to John McGuire and Beth Griffiths for their hospitality and to the American Music Center and Mary Jane Leach for hosting our interviews. Daron Aric Hagen regaled us with stories of the very intense ups and downs of an opera composer, causing us to ache with laughter. Doug Geers exposed the life of an eclectic doctoral candidate avoiding the intellectual gunsights of an east coast musical establishment. Jeff Harrington talked in detail about how he composes with intense listening-loop feedback, what software he uses, and his future plans. Elodie Lauten explained the earth tone and other cycles that underpin her composition and performance -- and secrets from her musical past. Eric Salzman proclaimed that the future history of new music will be written about and through music theatre in its many guises. On arriving home, K&D received a disheartening surprise in not receiving an expected grant to transcribe its interview series into text for historical purposes and handicapped access. Please help us with this important task. Don't forget: This week, January 8, listen to guest host Peggy Madden engage in mayhem with K&D!